The great thing about hosting an event is you can wear whatever the heck you want to wear. And I take full advantage of such a situation, as does my sister who is always the hostess with the mostess. She hosts amazing brunches, dinners, movie nights, and glitter-filled New Year’s Eve parties that rock until dawn and she always looks fantastic. Caftan Glam: A loose dress or caftan in a beautiful print and fabric can keep you comfortable AND chic. The way to make it look festive and not as though you're ready for bed is accessories: consider a pair of statement earrings and a bold lip to complete the look. I like where you’re going with a maxi dress and flip-flops, but encourage you to take it to the next level. At home, you can be a bit more flamboyant and relaxed. Consider a caftan in an amazing print, possibly with some beading or sequins paired with velvet or marabou-topped mules. A wrap maxi dress in a stretchy fabric and a gorgeous color or print. A cashmere off the shoulder sweater tunic with statement earrings and faux leather leggings. A black lightweight turtleneck tucked into a maxi skirt from a wildly printed fabric (Etsy is my go-to for such statement skirts). I have a black jersey off the shoulder long-sleeved maxi dress I got a decade ago; that with some fantastic earrings and a pair of comfy flats is often my hostess ensemble. Maxi Dress, Maxi Style: A maxi dress, especially one with a wrap silhouette is a great choice when hostessing an event. A silky or stretchy fabric will be comfortable as well as elegant. Style with accessories to add glamour and a festive feel appropriate to your specific event. Do you get hot when planning a party? No time to do your hair? Why not tie a silk scarf over it? When you are not only the host but the guest of honor, you have even more of a right to wear whatever the eff you desire. A fascinator, a pair of false lashes, a sequined cocktail dress, your favorite pajamas with a feather boa. Have an outfit that you adore but just don’t have the right shoes for it (or is that just me?). It’s the perfect thing to wear at home because you can go barefoot! Don’t be afraid to be the most dressed up or glam person at the event, you are the hostess and you actually will put others at ease knowing they won’t stand out because you’ve already taken that role and rocked it. Pajama Chic: Pajamas have become daytime fashion in the past few seasons, and are a great choice of what to wear as a hostess in your own home. Jewelry and/or ultra-glam makeup will make it clear that the look is purposeful and festive. I highly recommend a comfy pair of shoes. Mules are perfect because they keep your feet warm, are easy to slip on and off, are often embellished and festive looking, and are chic even though they’re flat. You can dash around your house and out to your car without breaking an ankle or have aching feet the next morning. A pair of bedazzled mules are a great wardrobe addition as they are also great to slip on with jeans and a blazer on the weekend. 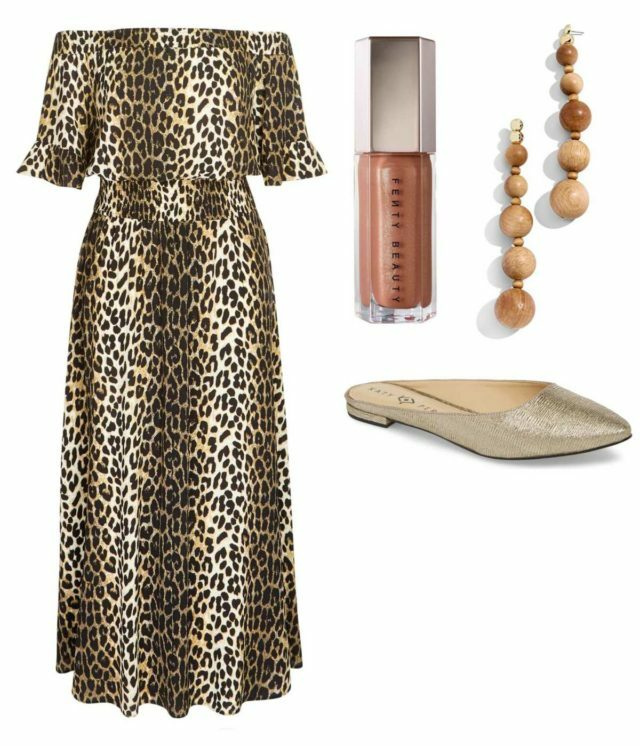 Leopard Luxe: When dressing to hostess an event in your home, there's no better place to go bold. Strong prints, silky fabrics, off the shoulder silhouettes, full skirts… all go when you're the queen of the castle. Accessories are your friend. Over the top statement earrings, a bold lip, a flower or fascinator in your hair, a bit of glitter on the eyelids and highlighter on the cheek bones. When you’re the hostess you have the right to try false lashes, blue lipstick, a purple smoky eye or a thicker flick of liquid liner. Since you may be stressed and your overworked oven may heat up the house, consider putting on your makeup last and holding it in place with a setting spray. Hair accessories can be your friend if you’re one to get hot and sweaty when prepping. A large fake flower on a clip is amazing for pulling back unwieldy hair and making it look fabulous. And finally, the best accessory I learned from my sister is a fantastic apron. If it's beautiful, you will be more likely to wear it, thereby protecting your fabulous outfit! Funny that you suggest flat shoes. Almost the only time I wear heels is if having a party at home. I know I don’t have to walk anywhere, and I can always change if they get too much. Just avoid getting cooking fat on suede shoes! Oooh that’s a great point about heels! I am fortunate to have recently moved into a beautiful home that *looks* expensive, and I feel like a lot of my friends, and especially family, find it a little hard to relax because it’s “too fancy”. (We still have our same old Ikea stuff in the house, and haven’t decorated like the Trumps or anything.) I can only imagine the reaction if I came floating through the door in one of these outfits! I dress very plainly for hostessing for this reason, because I want to give that “make yourself at home” vibe as much as possible. Of course everyone has their own style, and I don’t mean to scold anyone for looking fabulous. Just offering another point of view! Thank you for sharing your perspective, it’s true not everyone has the same lifestyle, friends, or events and therefore not everyone will be comfortable in my suggestions. I’m with you on the apron, and would note that if you’re going to be fiddling around with food/drink, big sleeves can be a problem. I felt the same way! I recently read a book on 30s style and was swooning over the fabulous nightgowns and hostess gowns, thinking noone could west that today – but these looks fell very similar. They also look great, just not like something I’d wear. So for those similarly un-dramatic hostesses: how about a jersey or ponte dress in your favorite silhouette? I’d personally go for fit and flare, in a beautiful color. Easy to move around in, easy to wash, easy to glam up. I know it’s not for everyone, I did go a bit over the top but I figure those who know their style will stick to what makes them most comfortable! Thank you so much Allie! Blue lipstick and “Queen of the castle” YES YES YES! What a boring host I’ve been so far, but that’s going to change right now! I can’t wait to have more guests now, just to dress up! Again, Thank you, it so appreciated! Yeeeesss that kaftan *swoon* seconding that one. I love kaftans, or loose maxi dresses, for hosting… they’re comfortable, the right accessories can make them look glam, and NOTHING you do is going to make you flash the room (we have small children, so hosting and being glam and taking care of the under-2 set is a challenging set of requirements for clothing). Seconding that first rec, HARD. PJs, though? You’d need someone with amazing amounts of confidence to pull those off. Or a brunch. I can host a brunch in PJs. LOL I do pajamas with heels and a bra and have them oversized so they drape instead of looking like I just woke up. It is a good brunch look! The kaftan looks like something I would go for. I’d love a whole closet of them! Perfect timing! I am hosting a small dinner party in two days and what to wear was on my mind. No time for new but I will go through my closet again and reassess. Thank you.